You, dear reader, are looking at what has got to be one of the most depressing Christmas beverages ever produced by a chain of coffee bars. 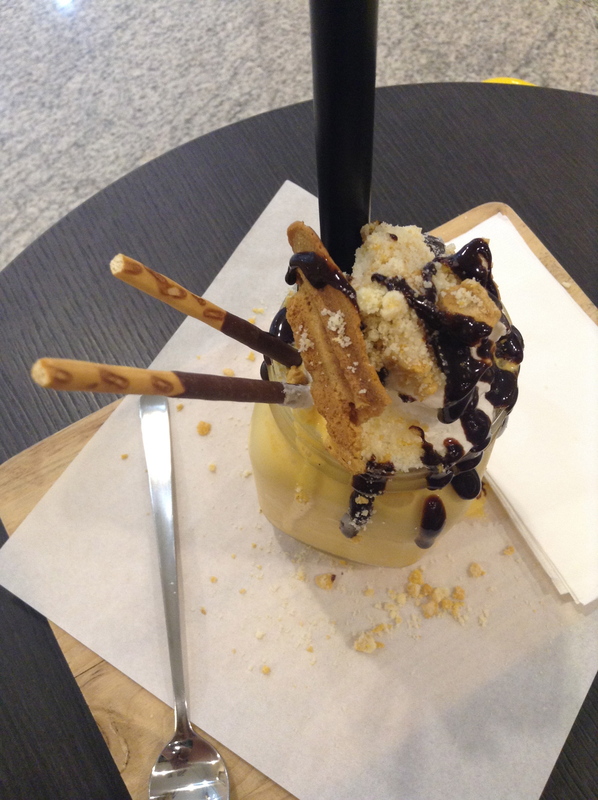 This is from Starbucks‘ 2015 Holiday Menu: an Italian Pannettone Frappucino. In essence, it is supposed to be a liquefied, drinkable, coffee-infused version of pannettone: that sweet, golden yeast bread studded with fruit and nuts that graces the Yuletide table in that part of the world. The reality, however, is absolutely horrid. Either in Frappucino or latte form, it just doesn’t work. The first sip carries a disturbingly yeasty aftertaste; quite palatable, to be honest. However, as you sip further down the drink and the taste of fruit and nut kick in, the aftertaste becomes strangely salty for some reason and unpleasant. Definitely not an experience I am keen on repeating. 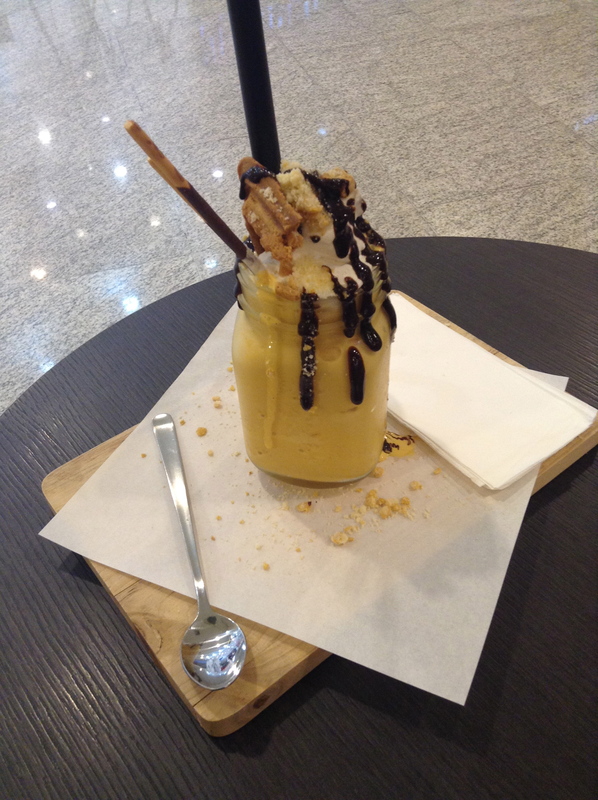 I ordered this drink fancying that it would be close enough in flavour to the much-missed gingerbread latte; sadly not. If you’re collecting stickers for a planner from Starbucks, skip this and go for the toffee nut latte – which is probably the most palatable seasonal drink currently on the menu. In the West, there is an elusive beverage known simply as a pumpkin spice latte. Said to be a harbinger of autumn in that part of the world, it is a melange of espresso, steamed milk, whipped cream and pumpkin pie spice, a sweetly fragrant blend of cinnamon, nutmeg and cloves. However, there is – to the knowledge of those in the know, really – absolutely no pumpkin in a pumpkin spice latte. What a travesty! What a sodding, crashing bore! Now, really: I love dishes made with pumpkin, either sweet or savoury. There is nothing more comforting than coming home on a rainy evening and sitting down to ginataang kalabasa (kabocha pumpkin cooked with sweet onions, garlic, and salt-dried fish) over a steaming plate of rice. Pumpkin bread, on the other hand, is so much more satisfying than banana bread, especially when heaped over with crunchy peanut butter whilst still hot from the oven. So, I went meh at the notion of a pumpkin spice latte. I did not, though, turn my nose up at the pumpkin spice milkshake they have over at Milk Box, a new breakfast/dessert spot in Alabang. 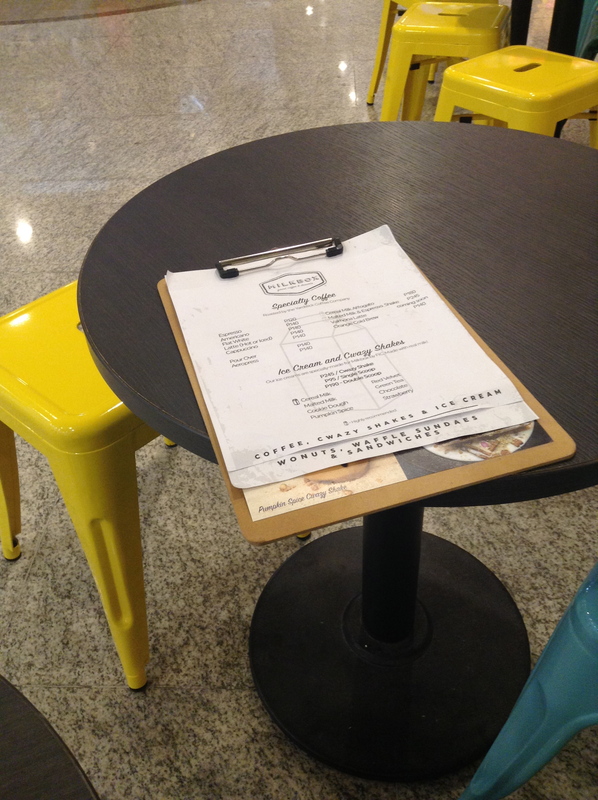 Milk Box is brought to the public by the same team behind the popular third-wave coffee bar Yardstick over in Makati. It’s small southern outpost serves its signature coffee blend as well as a few other coffee-based beverages. But its primary stock in trade is waffles and wonuts (well, waffles deep-fried like donuts till magnificently crunchy all over), as well as what they call Cwazy Shakes. These are not garden-variety milkshakes; no, these take after the recent trend from Australia for insanely decadent, seriously over-the-top milkshakes topped with whipped cream, sweet syrups, and bits and bobs of cake, pie, or what not. Also, these are insanely thick and bewilderingly rich (hence the name) made as they are with ice cream custom-blended by Fruits in Ice Cream for Milk Box. The pumpkin spice Cwazy Shake was what I opted for, seeing it was Hallowe’en when I paid Milk Box a visit. (So seasonally appropriate!) This rather baroque confection features FIC’s pumpkin spice ice cream which is really made with pumpkin (thus the colour and the sweetly vegetal shreds of sweetened gourd scattered throughout the golden mixture) and a proprietary spice mix that calls to mind autumnal pies and similar desserts. The massive mug is served atop a wooden board and comes garnished with a generous dollop of whipped cream, rather sloppy (in an appealingly aesthetic manner) splodges of chocolate syrup, a crunchy waffle wedge, chocolate-coated pretzel rods, and a generous scattering of crispy wonut crumbs. See how THICK this beast is?!? 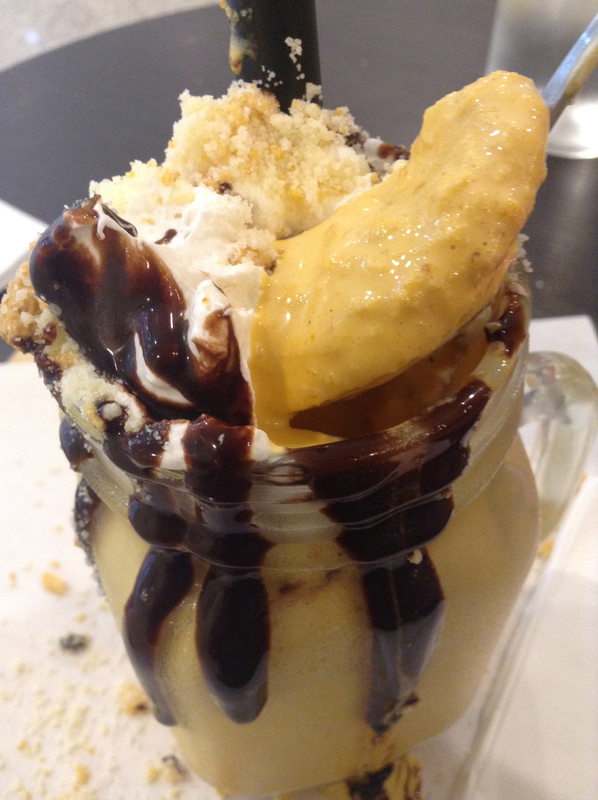 It’s quite thick, so you need the spoon to scoop up the shake and eat it the way you would a soft-serve sundae. As far as pumpkin-flavoured desserts go, this is the real deal and is certainly a better buy than the sadly misnamed and totally pumpkin-free cups of overpriced coffee being flogged by certain commercial coffee chains. Trust me: if you want a real pumpkin spice treat, this is the proper way to go. There are other flavours available, of course, but this first taste of what Milk Box can offer has lingered with me. I look forward to having another one quite soon. It’s been ages since I’ve hung out in Makati – months, as a matter of fact. Relocating to the Bonifacio Global City has opened up a lot of new culinary experiences, but I’ve missed the place where I started my career in advertising, where I spent the bulk of my career. Since I was out running an errand for the office in Legaspi Village this morning, it gave me the opportunity to grab a bite at one of the new third-wave cafes that have sprung up in the area. And I was not disappointed. Local Edition is one such cafe. 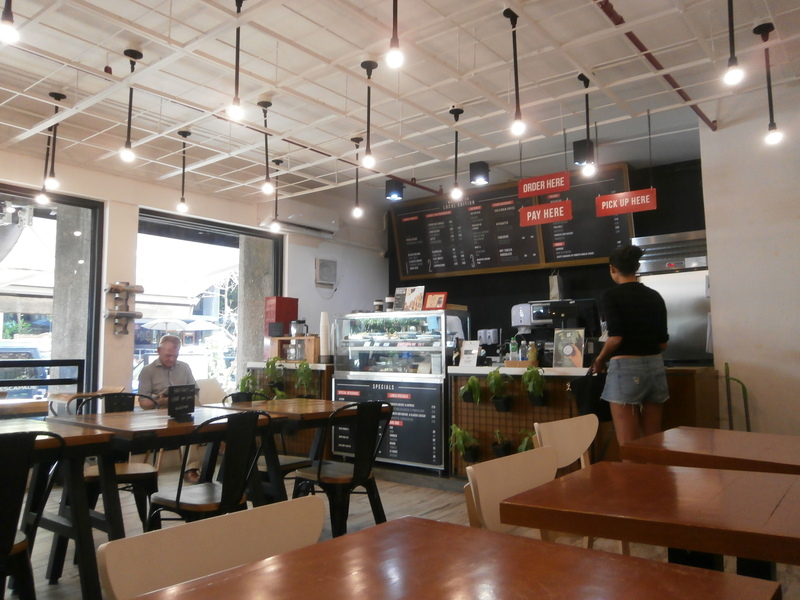 Small, homey yet hip, it is representative of the newer sort of coffee bar: definitely no part of any chains, foreign or local; emphasis on fresh brews for both coffee and tea; both drinks and dishes are prepared just as you order them (no stale meals here! ); and a focus on local purveyors. And believe me when I say it’s all good. 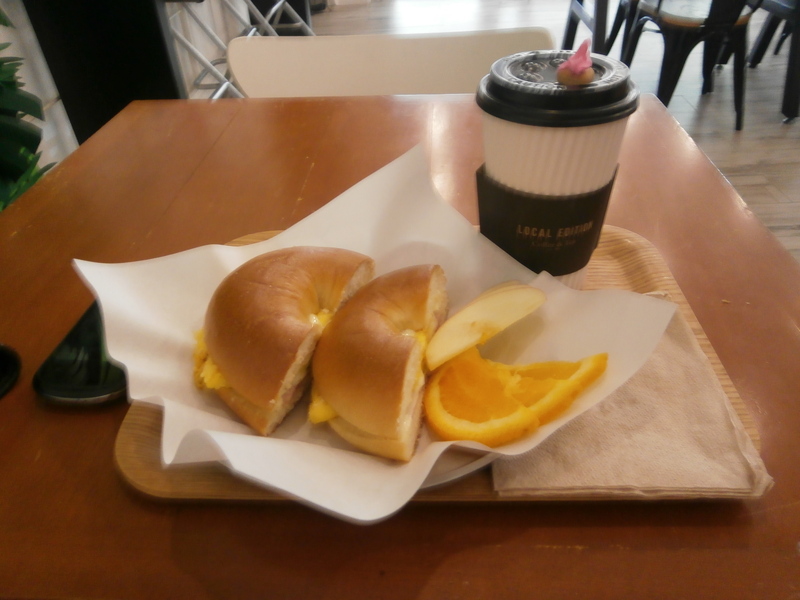 The breakfast bagel (P 215.00) is one example. You get a just-prepped chive omelet and a slice of ham tucked into a nice, chewy flour bagel. Properly toasted and dressed with a tangy mayonnaise, it makes for a filling brunch. And the addition of fresh orange and apple slices adds a healthy touch. But the real treat here is the coffee. 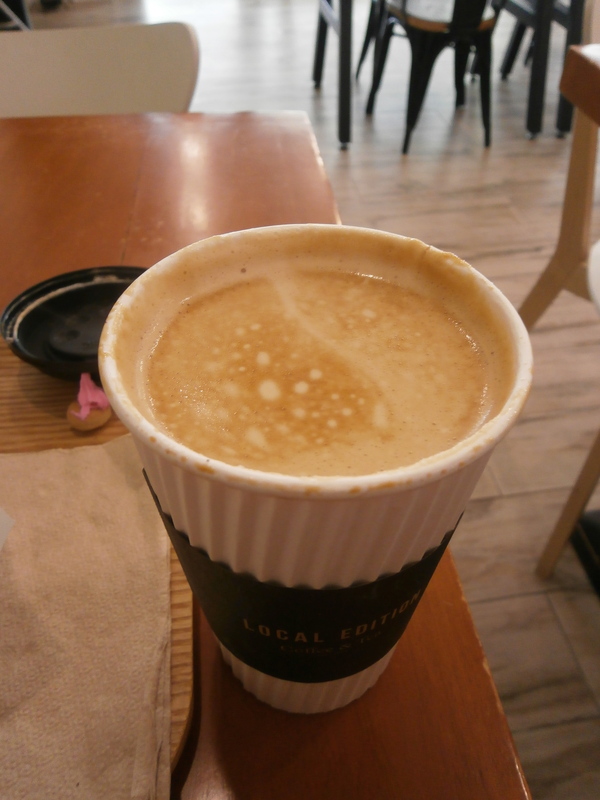 A freshly-brewed flat white (P 155.00 for a large) is just the thing you need to get some energy. Made with Local Edition’s signature Perea Brew blend, it is just strong enough to wake you up but not so strong as to get you all wired. The bitterness and acidity are balanced just so and the addition of milk makes this creamy, smooth, and just faintly sweet…just the way I like my coffee. Now, really, I wish they’d open a branch in my neck of the woods, but that would take away much of this coffee bar’s charm. That said, I’ll be happy to pop in again…well, soon as I find myself running another office errand in Makati!